If there’s one common that I want to present to you, it’s this one! I was fortunate enough to be able to attend its conception, so it’s moving to see, a few years later, that the baby has grown up well and is working like a charm. What is it all about? 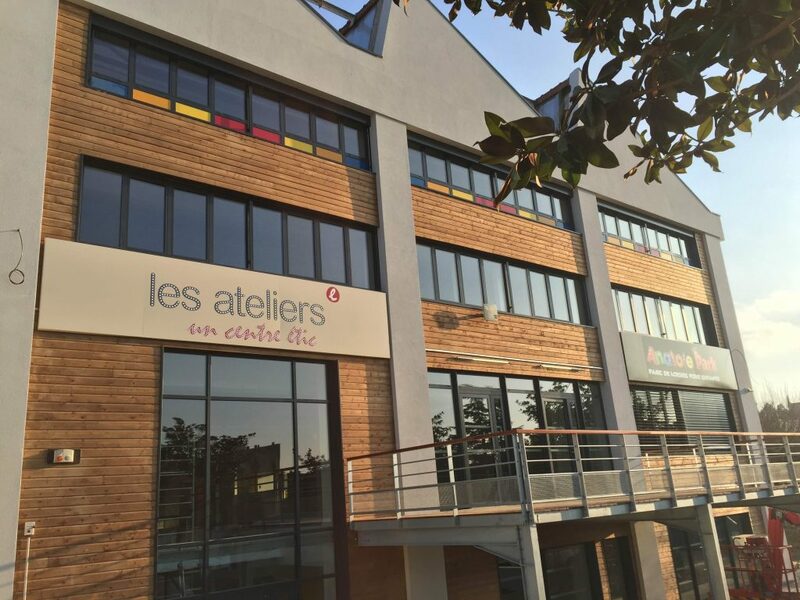 The “Les Ateliers” cluster, located in Castres in Tarn, is a place dedicated to the development of sustainable economy. It is almost 4000m², located just a stone’s throw from the city centre, fitted out to accommodate a whole lot of projects in connection with the Social and Solidarity Economy (ESS): a shop of local producers, a restaurant that buys from them, a recycling plant, a coworking area, offices and spaces for rent, etc. Barely a year after its opening, it looks like this place has been part of the landscape for ages. However, it took time, energy, creativity and the concerted actions of an entire collective to make it happen. The story begins in the late 1990s. Pierre has been an entrepreneur and head of the family textile business for 20 years, inherited from his father and grandfather. Over the years, he contributed to the company’s growth from 40 to 250 employees. Then suddenly, the European borders opened up, especially to the Chinese market. It didn’t take long for customers, seduced by half-price deals, to desert them and for the banks to let go of the company. By the end of 2008, its fate was sealed: first liquidation and then dismissals. “Humanly, it happened with a lot of respect, no one was responsible for the situation, but it was very hard for everyone” Pierre says. If I wanted to present this project to you, of course it is because I was personally involved in its start-up, and the energy deployed by Pierre, Jean and the collective impressed me very much. But it is also because today, Les Ateliers seems to me to be an exemplary achievement of “commons”, or rather, several interlocking commons. In terms of buildings, the property owner Etic now owns the place, ensuring the project’s longevity. In the cooperative, the functioning of governance allows everyone to become involved and feel that they are part of the initiatives. Even within the structure, freelancers installed in the co-working space have recently decided to meet under the brand name “Les Ateliers de la Com” to answer calls for bids together. Of course, there are experiments at all levels, so everything is not without risk and decisions change with experience. Although profitable activities partially fund activities that do not finance themselves, the economic model is still seeking to be refined. Many services are and have been provided free of charge. At this level, the cooperative seeks to develop partnerships with institutions in order to be supported by demonstrating the impact and interest of the project for the territory.